According to his military service records, Isum Gwin was 35 years old and a resident of Alfordsville in Daviess County, Indiana when he was enlisted by John W. Tucker on August 9, 1862 into what became Company D of the 80th Indiana. Isum was appointed by Tucker as the 1st Sergeant (also called Orderly Sergeant) of Co. D on August 16, 1862. He was mustered into the Union Army at that rank for a 3 year term of service on September 3, 1862 at Camp Gibson near the town of Princeton in Gibson County, Indiana. At that time the Army noted he was a "Farmer" and stood "5 feet 7 inches" tall with "blue" eyes, "light" hair and a "fair" complexion. As 1st Sergt., Isum Gwin was the highest ranked Non-Commissioned Officer (NCO) in his company, and was fourth in command after 2nd Lieutenant William F. Green, 1st Lieutenant Jacob Scammahorn and Captain John W. Tucker, the company commander. Sergt. Isum was recorded as "Present" with the 80th from its official formation on September 3, 1862 until May 2, 1865. On October 8, 1862 the 80th took part in the bloody fighting at Perryville in Boyle County, Kentucky. This was the first time the regiment was in combat ('saw the elephant' as they said back then) and it took place just 30 days after it had first drawn its uniforms and weapons. During 2 hours of heavy fighting the 80th lost 25 men killed, 116 wounded, and 16 captured out of the 738 men it took into the battle. This was a 27% casualty rate, and amounted to 45% of all casualties the regiment would suffer during its entire service. According to his service records, Sergt. Gwin "Lost Coat and Blanket Knapsack Shirt [and] drawers in battle" at Perryville. According to a letter in the possession of the Gwin family, Sergt. Gwin fell in front of a horse-drawn Army wagon and it ran over his head in late October, 1862 between Lebanon and Danville, Ky.
On January 30, 1863 Sergt. Gwin was commissioned as the new 2nd Lieut. of Co. D by Indiana Governor Oliver P. Morton, replacing Lieut. 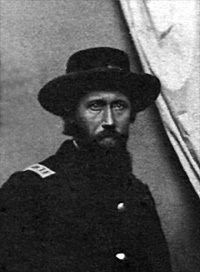 Green who had resigned his commission and left the Army on December 20, 1862. Isum received his commission on March 25, 1863, but then his promotion paperwork got lost. This resulted in a 6 month delay in mustering him in at his new rank, during which he worked as an officer, but was paid as a 1st Sergt. To add insult to injury, 2nd Sergt. John W. Clark was promoted over Gwin's head to be the new Captain of Co. D when Capt. Tucker was promoted to be the 80th's new Major. In August 1863 the 80th departed Kentucky and marched over the Cumberland Mountains into Confederate-held Eastern Tennessee as part of a large Federal force under the command of US Major General Ambrose E. Burnside. There, on October 12, 1863 at Loudon in Loudon County, 1st Sergt. Gwin was finally mustered in as the 2nd Lieutenant of Co. D.
The 80th spent a very cold, miserable, hungry winter in Eastern Tennessee, primarily at Loudon, but also near Knoxville at Strawberry Plains in Jefferson County and at Mossy Creek. On February 24, 1864 2nd Lieut. Gwin was commissioned as the new 1st Lieut. of Co. D by Gov. Morton, replacing Lieut. Scammahorn (he had resigned his commission the previous June, but had not been officially discharged until February 1864). Isum received his commission on May 11, 1864, but once again events transpired to delay his promotion and pay, this time due to the demands of an active military campaign. At the time the 80th was in northern Georgia, taking part in the opening actions of the famous 4 month campaign led by US Major General William T. Sherman to capture Atlanta Georgia. Three days after his commission arrived, the 80th took part in the bloody fighting at Resaca, Georgia, on May 14, 1864. There it suffered 26 killed and 100 wounded out of the 270 men who were ordered to take part in a doomed charge against entrenched Confederate troops. This was a 47% casualty rate, one of the highest of any Federal unit in the battle. Lieut. Gwin wrote the following about that day in his diary. "Co D 34 guns...ordered to advance and charge the Rebble forts at 12 O'clock got in [no closer than] one hundred yards of the [enemy's] works [where we] remained until dark when I went to the Regt." On July 1, 1864 Lieut. Gwin was commissioned by Gov. Morton as the new Captain of Co. D, replacing Capt. Clarke who had resigned his commission in mid-June. Sergt. Warner G. Smoot was commissioned to replace Gwin as 1st Lieutenant, and the 2nd Lieutenant position was left permanently vacant. During this period the 80th was marching and/or fighting on a nearly continuous basis. In fighting on July 19, 1864, near Decatur, Georgia, Lieut. Gwin earned the following praise in an official report by Major Tucker, who was then commanding the 80th. "...on the 19th met a heavy rebel force; attacked and drove them beyond Decatur, losing a few men wounded. Here I wish to speak of the efficient, brave, and gallant conduct of First Lieut. Isum Gwin, Company D, who had charge of the skirmish line of my regiment. He drove the rebels, having to advance through a field under a galling fire, yet with that courage rare and only belonging to the brave, led forward his men, being present at all times where most needed, steadily driving the enemy, killing and wounding many, proving himself on this occasion, as on every other, worthy of a better position..."
A step in that direction was achieved on July 25, 1864, near Atlanta, Georgia, when 2nd Lieut. Gwin was officially mustered into the Army as the new 1st Lieut. of Co. D. About that time he wrote the following to his parents back in Indiana. "To day has been tolerable quiet but little firing -- I think the Johnnies are getting tired or they certainly have reason to be quiet their loss in killed wounded and prisoners is estimated at 25,000 men since our Army crossed the Chattahoochee River...our loss will not exceed 10,000 men. Our Boys [in Co. D] are in tolerable good health and spirits... Your Son untill Death." It was not until September 8, 1864 at Decatur, Georgia, just after the Confederates abandoned Atlanta, that 1st Lieut. Gwin was finally mustered in as the new Captain of Co. D. The Army made his elevation retroactive to July 1st, which led eventually to his being paid at as a Captain for those months. In the fall of 1864 the 80th was detached from Sherman's forces and ordered back to Tennessee. There during a 3 day period in late November the 80th was force marched from Columbia to Spring Hill, where it narrowly escaped capture, on to Franklin, where it built breastworks and fought in a desperate 5 hour battle, and then through the night to Nashvillle. There in mid-December it took part in the 2 day battle that effectively destroyed the Confederate Army under Major General John Bell Hood. The 80th was then transferred to Washington, D.C. and on down to North Carolina to rejoin Sherman's forces. It was camped at Raleigh in April 1865 when the war ended with the surrender of most of the remaining Confederate forces. There on April 28th Capt. Gwin wrote the following request for a 30 day leave of absence. "I have been in the service nearly (3) years and have never had a leave of absence. I have been with my Company ever since the Regt was organized. On entering the service, I left my businesses unsettled. It is now in such a condition that it needs my personal attention." Capt. Gwin's request was approved and he departed for Indiana on May 2, 1865, leaving 1st Sergt. John Harris in command of the company (Lieut. Smoots having been discharged the previous month due to disabilities). Capt. Gwin was back with his company when he and the 43 others still in its ranks were honorably mustered out of the Army on June 22, 1865 at Salisbury, North Carolina when the regiment was disbanded. The surviving veterans of the 80th Indiana reached Indianapolis on July 3, 1865. There on the 5th they were addressed by Governor Morton at a gala reception dinner, and on the 8th were paid off and released to their homes as civilians. For more about Capt. Gwin's experiences during the war, click the History link below to read what happened while he was with the 80th, including excerpts from the pocket diary he kept during the Atlanta Campaign. To view a post-war image of Isum in civilian clothes, click HERE. If you have additional details about him that you would be willing to share, then please contact Scott C. Meeker using the link below. Sources: Genealogical data provided by Isum's Great Grandson Kenny Gwin; letters and personal diary of Isum Gwin (Georgia, 1864); Civil War Compiled Military Service Records by Office of Adjutant General of the United States (Washington, DC) and Regimental Descriptive Rolls, 1861-1865, Volumes III, IV, and VIII, Report of the Adjutant General of the State of Indiana (Indianapolis, Indiana, 1866). All Rights Reserved. Created December 11, 2004. Last updated December 12, 2004.